Adele and Taylor Swift succeed by writing and performing personal songs that connect emotionally with a fan base consisting mostly of women. But they have pursued markedly different approaches to building their personal brands, demonstrating that superstars can write their own rules. Taylor Swift, who turned 26 December 13, is all about accessibility. She saturates the public eye by courting the news media, being open on social media, touring heavily, and doing endorsement deals that keep her face visible. But she’s not only ever present; she also connects as personally with her fans as a pop star can. When she released her massive-selling album 1989 in October 2014, she surprised a few lucky fans by holding “secret sessions” consisting of exclusive previews of the album. She even brought baked cookies to the sessions. She is a constant presence on social media, commenting on her life, sharing visual stories, and reaching out to her fans on their own social accounts. Her social content is genuine, earning accolades from branding experts. Through social, she excels at “treating your fans like friends,” in the words of interactive marketing executive Joshua Swanson. Adele cultivates mystique. She is not quite a private diva like Barbra Streisand was in the 1970s, but she’s nowhere near as accessible as Taylor Swift is. She has tweeted a total of 20 times in 2015 (as of December 11), and she vets everything she tweets. Her social posts usually consist of bland news about her career. Adele maintains a private reserve. She does not do commercial endorsements. There is a sense of vulnerability about her, informed by her real-life experience of enduring a career-threatening throat ailment in 2011. She is only 27, but she seems like an old soul. Taylor Swift creates moments. Adele creates The Moment. In 2008, Adele broke through to U.S. audiences by owning a huge moment: an appearance on Saturday Night Live in which she sang “Chasing Pavements” and “Cold Shoulder” from 19. The appearance triggered a spike in sales for 19 and made her a superstar in the States. She marked the release of 25 with another highly publicized and well-received Saturday Night Live appearance that created a surge in SNL viewership. She followed up SNL with appearances on The Tonight Show Starring Jimmy Fallon and TODAY and will broadcast a one-hour special concert December 14 on NBC (it’s a prolific time for NBC and Adele). Adele is well suited for engineering giant moments that rely on the reach of mass media such as TV. She can use her powerful voice and commanding physical presence to make an impact through a televised concert. Television is not as kind to Taylor Swift. Her lighter voice and willowy presence seem small when she performs on televised events such as The Grammys. She is better off creating her own moments on social media and in her own well choreographed concerts and videos, where she can surround herself with a stage that plays up her assets. Each stop in her global, 85-show 1989 tour has triggered branding micro moments as fans capture the experience through Instagram, Tumbler, Twitter, and other social platforms. Her tradition of sending personal gifts to fans (moments she has documented on YouTube), dubbed “Swiftmas,” is a brilliant example of Swift at her best (even if she did attract some snarky criticism for attempting to trademark the term). 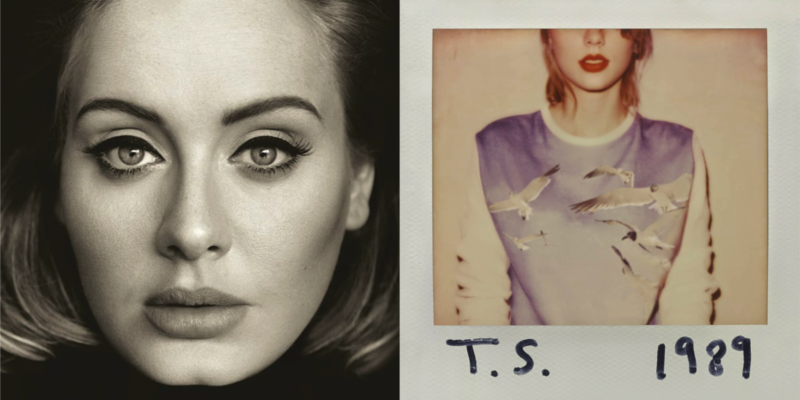 Both Adele and Taylor Swift are protective of their music, famously withholding their albums from streaming services such as Spotify. In 2014, Swift withdrew all her music from Spotify because she believes Spotify hurts music sales and fails to compensate artists properly (a view that is shared by many, to say the least). Adele restricted 25 from streaming services (and had initially done so for her last album, 21) to protect music sales. This is not to say that they’ve withheld their music from the digital realm — far from it. On December 13, Swift announced she would stream her 1989 world tour video exclusively on Apple Music December 20 as part of a broader co-branding relationship. Meantime, Adele’s single “Hello” has become the second-fastest video ever to hit 100 million YouTube views ever. Taylor Swift’s “Blank Space” and “Shake It Off” have more than 2.5 billion views between them as of December 11. “Hello” and “Shake It Off” also express the distinct personas of these two superstars: the moody “Hello” dramatizes Adele’s brooding romanticism while the quirky and playful “Shake It Off” celebrates Swift’s chirpy optimism. Their strategies are working handsomely. Billboard recently named Taylor Swift its top artist for 2015. 1989 is only the fifth album to spend its first year in the weekly Billboard 200’s top 10. As of December, her 1989 concert tour had grossed $240 million. She is the first and only artist to have three albums sell more than one million copies in the opening release week. 1989 has sold 5.4 million units, and even though the album was released in 2014, it was the top seller of 2014 — until Adele’s 25 became the year’s biggest seller only three days after its November 20 release. As of December 11, Adele’s 25 has sold 5 million copies, the first album to sell 5 million in a calendar year since her last album, 21, was released in 2011. In its first week of release, 25 sold more than 3 million copies, setting a new record for most album sales in a single week — a feat even more impressive when you consider that the previous record holder, NSYNC, achieved its massive numbers before the era of digital downloading and streaming. At one point, 25 was accounting for nearly half of all music sales. But most importantly, Adele and Taylor Swift share a commitment to writing personal songs about their lives, oftentimes about the ups and downs of relationships. They have inherited the mantel of heartfelt singer-songwriter from the likes of Carole King, Joni Mitchell, and Stevie Nicks. By drawing upon universal themes such as the heartbreak of loss, the joy of independence and sexual liberation, and the pleasures of growing up, Adele and Taylor Swift write songs that appeal to a broad audience. Their personal brands extend the reach of their songs even more widely. What works for Adele and Taylor Swift may not work for lesser-known artists although Swift’s accessibility to fans and brands is a more advisable route for unknowns attempting to build their reputations. It remains to be seen whether lesser artists can afford to avoid streaming like Adele and Taylor Swift have done. Few musicians have the clout they possess. But if the up and comers can make it to their elite level, Adele and Taylor Swift demonstrate that successful artists can still write their own rules even in the fractured music industry. This entry was posted in Music and tagged "19", "25", "Hello", "Saturday Night Live", "Shake It Off", 1989, Adele, David Deal, Spotify, Superhype, Swiftmas, Taylor Swift. Bookmark the permalink.